FIG Council announces the bidding material for the Congress 2022. All member associations are encouraged to consider to submit a bid. Election of the destination will take place at the Congress 2018 and General Assembly in Istanbul, Turkey. The call for bids for this prestegious event for 2022 is now out. The FIG Congress is the large 4-year event that marks the end of the term of the current leadership, and where a new President and two Vice Presidents will be elected. 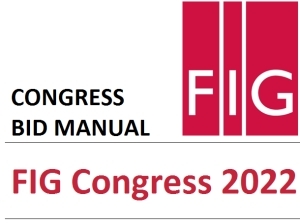 FIG Council invites all Member Associations to consider submitting a bid to host the prestegious FIG Congress 2022 together with the Federation. At FIG Congress 2018 that will take place in Istanbul, Turkey 6-11 May 2017 election of destination for this major FIG event in 2022 will take place. Presentations of bids will be done on the first General Assembly day on 6 May 2018 and election among all present member associatons in good standing will be on 11 May 2018. The bidding guidelines explain in detail the information that is required for a successful bid. Any association that is interested to host the FIG Working Week in 2020 is requested to email or call Director Louise Friis-Hansen, (tel. + 45 9391 0810) who will assist with any questions that you may have.